Scottish athlete Callum Hawkins has been discharged from hospital a day after he collapsed during the Commonwealth Games marathon and was left on the road without medical attention. Hawkins held a lead of almost two minutes after two hours running in temperatures of 28degC before weaving across the road and collapsing. Former athletes and media pundits expressed outrage at the time it took to get medical attention to the Scot, with Steve Cram labelling it a "disgrace" when commentating for BBC. Reports said it took almost two minutes for medical help to arrive. Scotland's delegation to the Games, which closed on Sunday, said Hawkins was back with the team. "Team Scotland is pleased to confirm Callum Hawkins has been discharged from Gold Coast University Hospital today and has been reunited with his team mates in the Commonwealth Games Village, ahead of the team's return to the UK," it said in a statement on Monday. "We would like to thank all the supporters and well-wishers for their kind messages of support and the care and concern that has been shown, particularly here on the Gold Coast." The delegation posted photos of Hawkins with Scotland team mates at the athletes village on Twitter. Organisers have said they would investigate whether there was an excessive delay in getting help to Hawkins, who had managed to get up and run another 100 metres or so before collapsing again and lying on the road in clear distress. 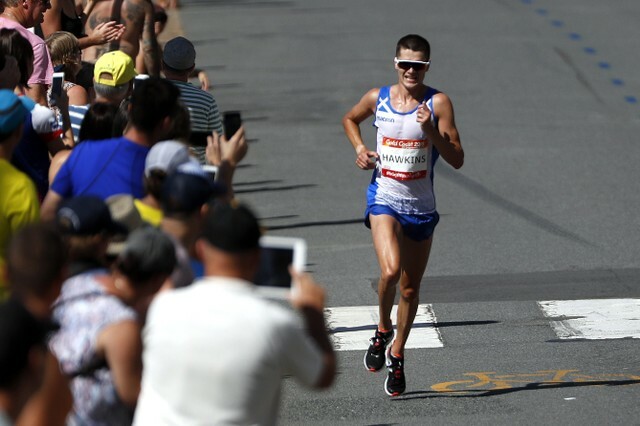 "You can't have medical people on every kilometre of the race," Gold Coast organising committee CEO Mark Peters said on Sunday.